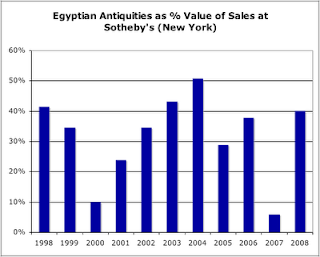 Sotheby's New York has sold just under US $50 million worth of Egyptian antiquities since 1998. This is some 22% of the sales of antiquities (worth US $230.97 million). This is slightly distorted by the sale of the Guennol lioness in 2007, even though this year saw the fourth highest sum raised for Egyptian antiquities (US $6.58 million). I have also been keeping an eye on past collecting histories. Some 67% of the Egyptian lots in this period (1998-2008) do not appear to have been known prior to 1973 (the date of the declaration by the Archaeological Institute of America). Some 95% of the lots have no recorded find-spots.